I just made an appearance in the Massachusetts General Hospital Newsletter: Targeted Cancer Therapies Make MGH Patient Optimistic — MGH Giving. Serendipity I guess, as it looks as if I’m about to enter my third clinical trial for a targeted therapy. On the 28th of April I will have a CT scan and then meet with Dr. Shaw. The expectation is that the scans will show progression; (but it sure would be nice if that expectation was inaccurate) and the plan is that I will sign the paper work to enter the PF-06463922 trial. If it’s a go, washout begins the following day; I will likely start the trial two weeks later. I had my second chest CT scan since starting on LDK378 a little over a week ago. The report from the radiologist was basically ‘stable’, But at a scan review with Dr. Shaw, there was clearly visual evidence of further improvement (lessening density of the ground glass opacities). The trial review board at Novartis must think so as well, because several days later Alice emailed to say I was now at the 40% mark, which is the cut off for a partial response. It’s not as clean in there as it was after I started crizotinib (Xalkori), at least not yet. But we’re working on it. 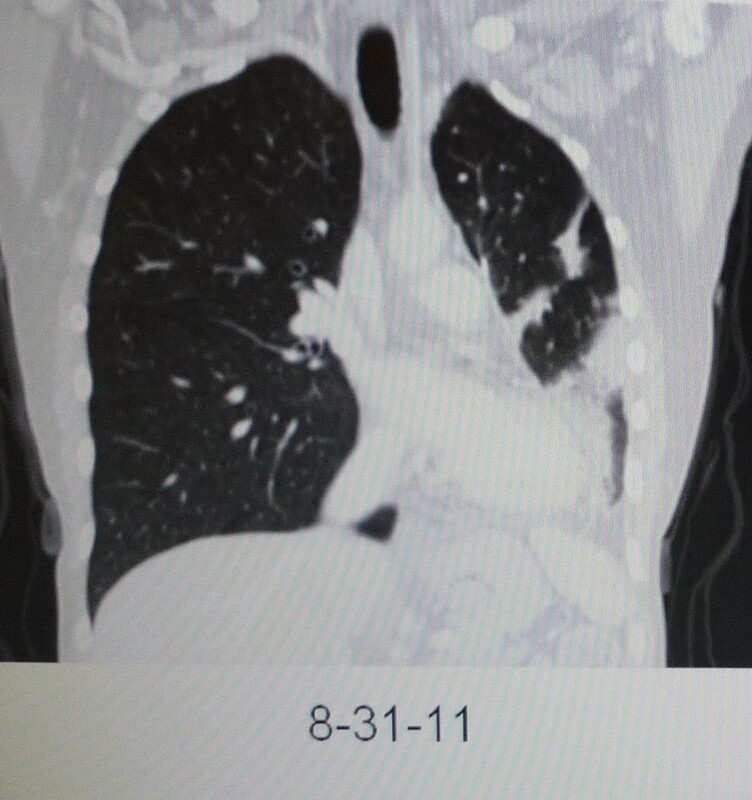 For comparison, here are the before and after images of my lungs in 2008. 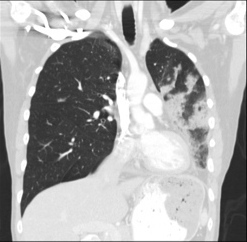 The left lung is actually on the right of each individual image. It is smaller than the right lung, because the entire lower lobe was removed in 2005, at the time of my diagnosis. Before I started the PF-03241066 trial (crizotinib, Xalkori), the remaining upper lobe of my left lung was getting pretty filled up with cancer, and you can see some activity starting in the right lung as well; particularly near the top. 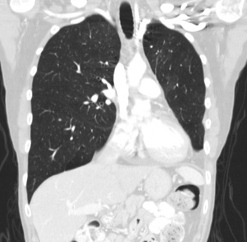 The image above is from a photograph I took of my chest CT scan as displayed on a computer monitor, so it’s not as clear as it could be. I’ve not included the two scans I’ve had since I started the trial, as I’m not certain if I am allowed to do that yet (as a subject now, not a patient, the rules are not the same). I’ve included this image simply to give you an idea of how much cancer had come back. Not as diffuse as in 2008, but well on the way and really rather dense in the bottom of the remaining upper left lobe. So, what I can’t show you, but can tell you, is that the most recent scan is significantly clearer (and if you are considering percentages, 40% certainly sounds twice as good as the initial 19% resolution). I’m no longer coughing and my lungs feel fine. This trial is in the dose escalation phase, and I entered at 250 mg. Per protocol, once the subjects at the next higher dose had gone without adverse events for two cycles (a cycle is three weeks long), I would be allowed to go up to that dose, or 500 mg. Last monday was my first day at the stronger dose. I’m hoping stronger=more effective yet. So all in all I’m feeling well. Occasional bouts of diarrhea would seem to be a side effect, and I’ve become mildly anemic, which leaves me a bit rundown and intolerant to cold (not quite as rosy as I once was either). It would seem to be a mixed etiology of nutritional anemia and anemia of chronic disease, according to my labs (and my oncologist!). My hematocrit is 31.2 (normal reference range 36-46), my hemoglobin is 9.6 (normal reference range 12-16) and my MCV (mean cell volume) is 72 (normal reference range 80-100). My iron level is 18 (normal range 30-160) and ferritin is 6 (normal range 10-200). In a subsequent post I will go into greater detail about anemia (I’ve been reading up on it, and it’s rather fascinating). So that’s the medical update. I’m off to eat some spinach.